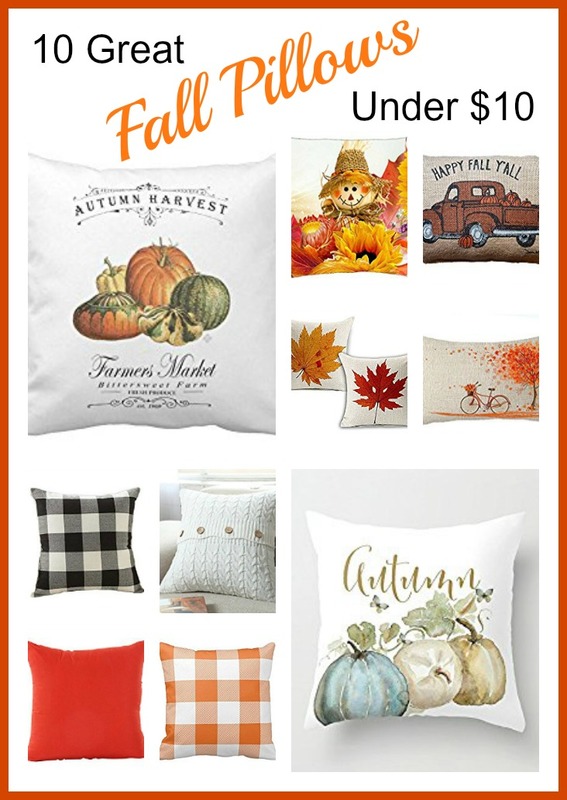 I love decorating for the seasons and Fall is my absolute favorite. But, what I do not like is taking down each season's decor and changing it out. Way too much work for this gal. So, I have decided it's time to keep it simple. No more changing out all the tchotchkes and baubles to herald the new season in. 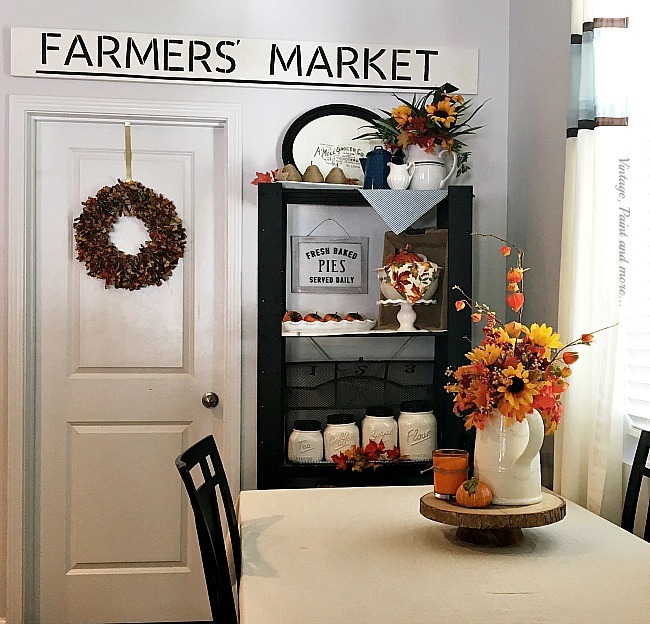 I have a basic main decor for each room and just simply add a few things to it to make the season known - for fall it's simply lots of pumpkins and faux foliage. These can be easily added to your decor in an afternoon without too much fuss. 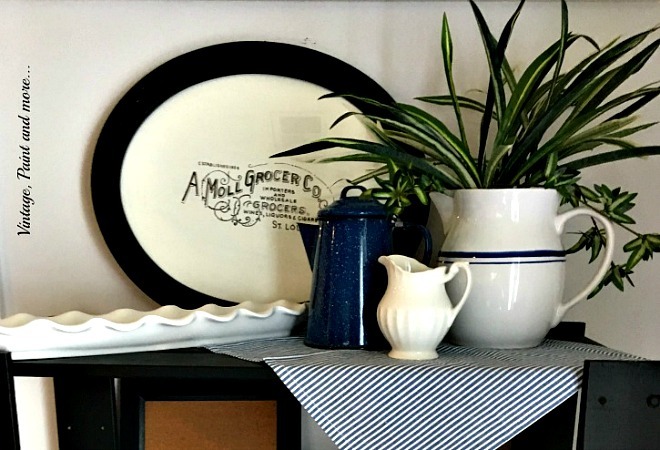 Let me show you how I made just a few small changes to my kitchen shelves to make them fall ready. 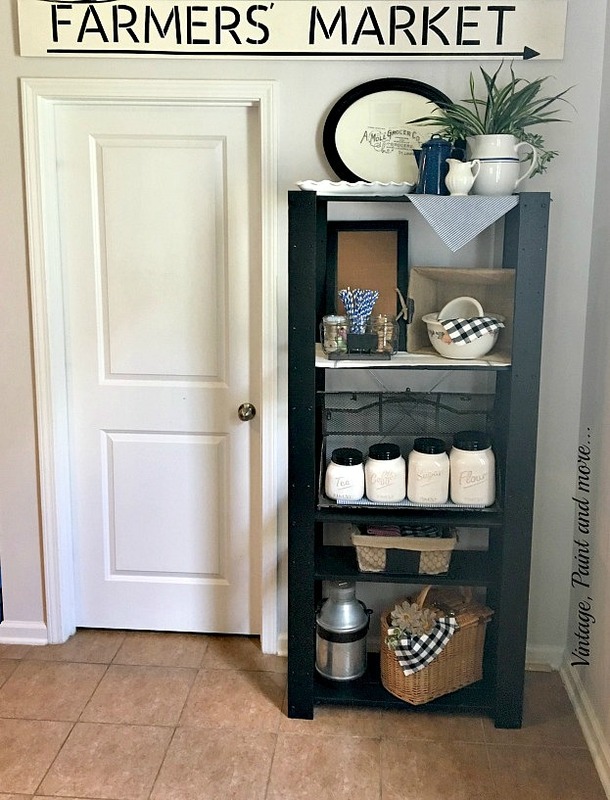 A few weeks back I shared my upcycled wood shelf unit I had added to our kitchen. 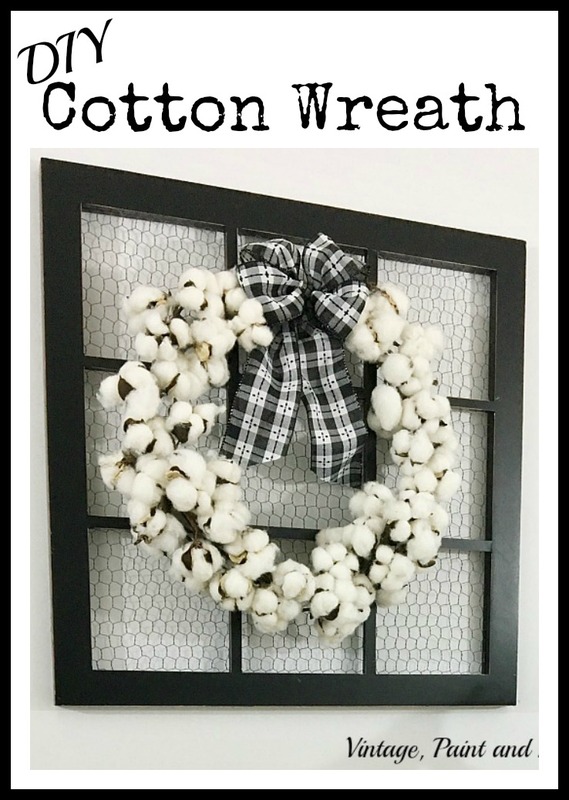 The decor was simple and can be used year round by adding a few small touches to reflect each season. I'm going to show you how I did that for fall by changing very little. First of all, this is a long view of this area. I have not shared this whole area before but plan on doing so in the near future as there are several DIY projects in here that I think you will enjoy. One of the easiest fall additions I did was to add a DIY fabric rag wreath to the door - the tutorial can be found here (For some reason this wreath looks almost black but is really browns with oranges, yellows, and rusts.) By doing so, it breaks up that large expanse of white and brings some texture and interest to the area. The shelf unit received most of the changes - however, very simple ones that took just a few minutes to do. You can see how very little makes a big difference. 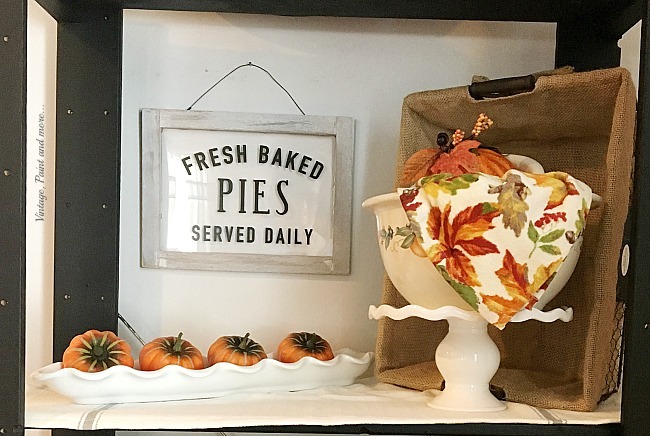 I simply replaced the long tray with a smaller one I had and added some Dollar store pears I wrapped with twine and a few orange leaves on it. Then I put some fall foliage in the large pitcher. That's it - simple but brings so much texture, warmth and fall color to this top shelf. I was at my one of my favorite places to shop - Target's Dollar Spot and found the little sign I hung in the place of the corkboard - this will become permanent. I also found the small cake stand I placed my mixing bowls on. 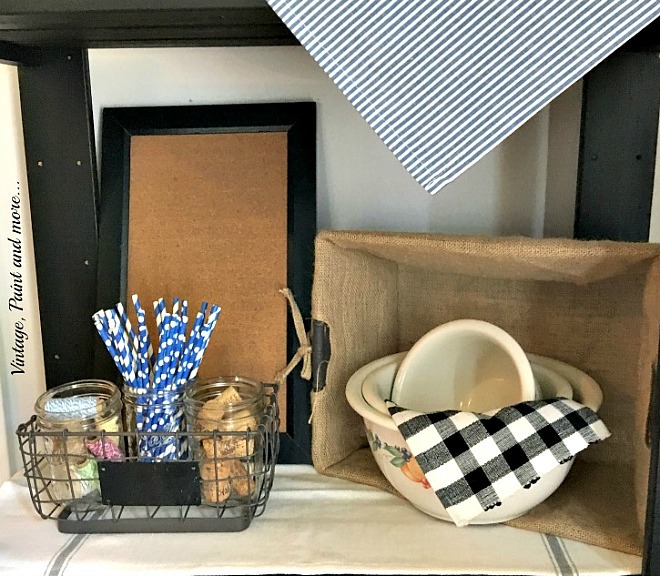 I simply changed the black and white check towel out for a fall printed towel and placed a pumpkin in the bowl. (Instant Fall!) I then turned the wire basket vertically instead of horizontally to adapt to the height of the cake stand. The long white tray that had been on the top shelf was placed on this shelf and four little faux pumpkins were placed on it. Very simple changes but also brought a lot of color and texture to this shelf. 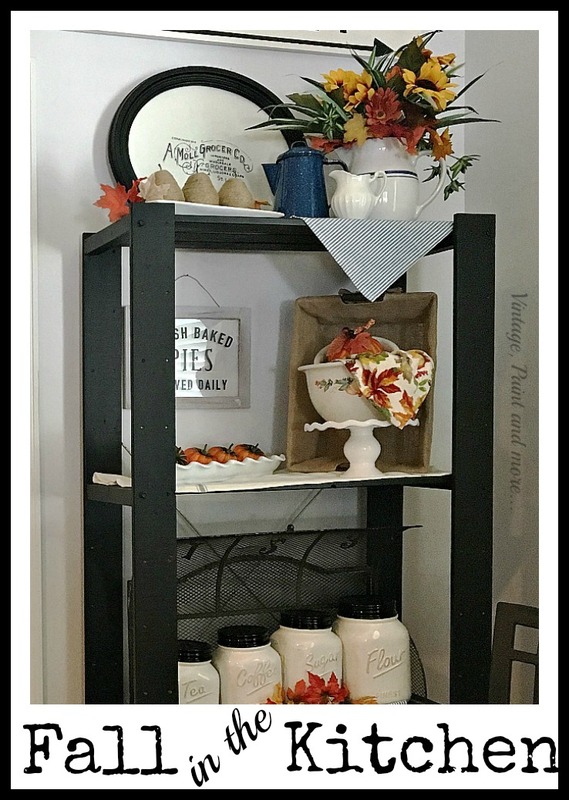 For the shelf with the canisters, I simply placed a few faux autumn leaves in orange and gold to bring in a little color. Nothing else was needed on this shelf. 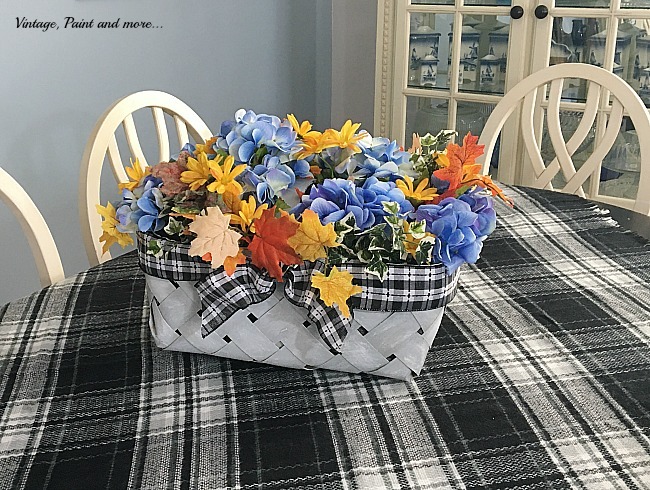 The table centerpiece is the one I use year round - I simply change it up by changing the flowers in the ironstone pitcher, the candle and whatever small object I want there. For fall I filled the pitcher with faux fall flowers of orange, yellow and rust. The candle is orange and has twine tied around it to give it a rustic look and then a small ceramic pumpkin was added. All of it is sitting on a wood cake stand. 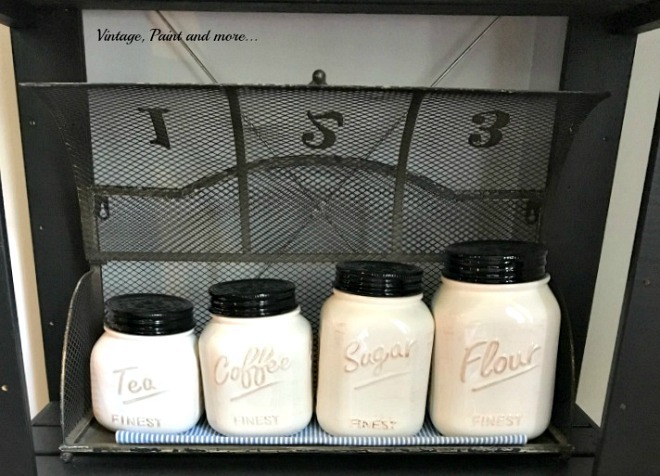 Perfect for a vintage, rustic, farmhouse look. How do you change your decor up for each season? Do you go all out or just make a few simple changes to bring the season to light in your home? I love to hear from you so tell me about it in the comments below. I will be joining the parties found on my Where I Party page. 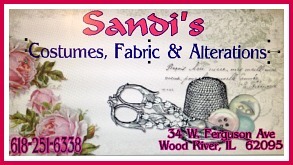 Be sure to go by and visit as many as you can - you'll find so many great projects and inspiration at each one. If you like this post be sure to sign up for my emails at the top of the page so you don't miss any. This post contains Amazon affiliate links for your convenience to help you find the supplies needed for this project. 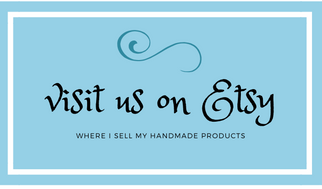 I make a small commission if you purchase through my links, but it doesn’t add anything additional to the cost to your purchase. Your purchases through my links helps me continue blogging and providing you with free content. If you do purchase through my links, thank you! I like your little pears! Thank you - it's an easy project I plan on sharing in the future. I am so with you on keeping things simple and just making small changes for the seasons or holidays. I love the easy changes you made - they look great! Your fall accents are perfect, Cathy! Thanks for sharing @Vintage Charm! Thank you. Love your party - always so much awesome inspiration there. I've heard other say that they always find something good at Target's Dollar Spot. I'm usually just making a mad dash in and out. I'll have to stop and take a look next time. 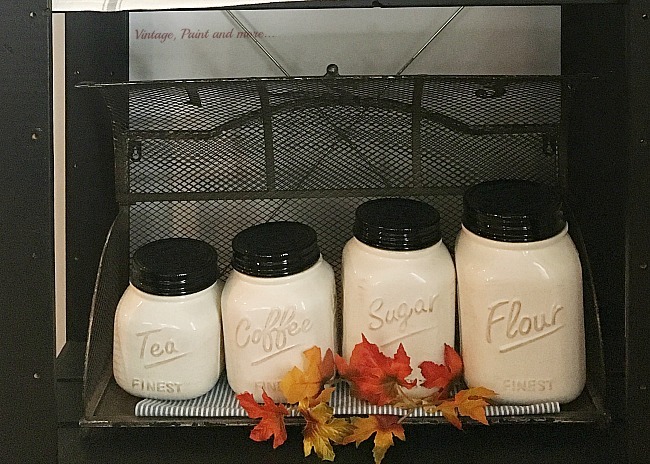 I love the simple touches you've added to bring Autumn into your kitchen. Very nice. Happy Monday! 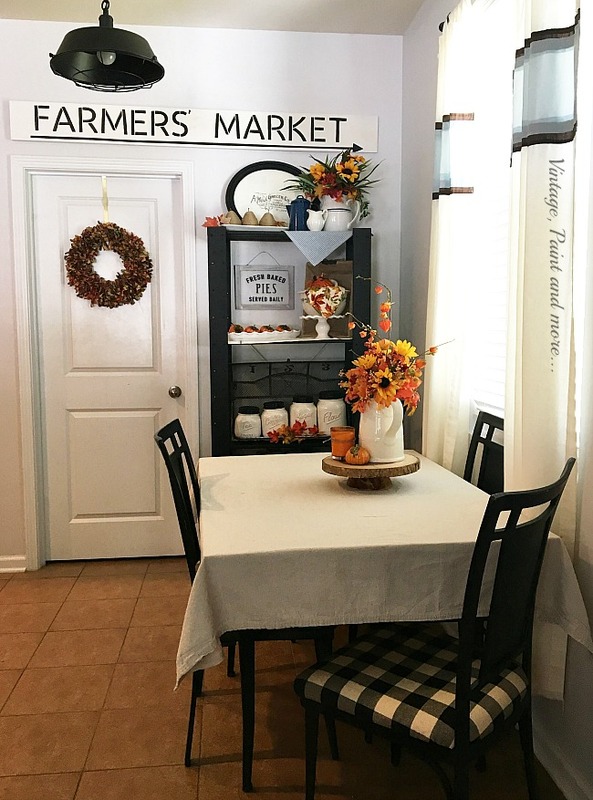 Your fall kitchen decor looks great. I agree with you about not clearing everything out. I used to do that, too. It's so much easier to just add in some fall pieces. Yours looks cozy and inviting. Thanks for sharing with us at Snickerdoodle. Pinning. Thank you, Beverly. I finally realized I was working harder than I needed to be - lol. Your decor looks very nice, festive and bright. This year is the first year I did a fall home tour and then decorated for Halloween and it is the last. Its too close together and its no more than up when you packing it all away. Oh, I agree with you - I do not do Halloween because of that - way too much work for me. Very beautiful Cathy! I really need to start doing this. I go all our and don't know how much longer I can keep doing it. lol! Thanks for sharing with SYC. I used to go all out for each holiday but, I decided it was just too tiring so am working this way now. I love your decor though Jann, it's always amazing to me. You are so right in knowing that a few simple changes can make a big impact, and you did a great job of proving that point. I always think I'm going to go simple, but then I get on-a-roll and pretty quickly I succumb. Thank you for sharing. Thank you so much. I will have to stop by.